I am participating in a blog challenge this month. It is called 30 Days About Me.. 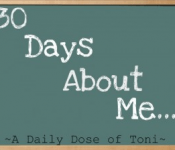 It is presented by the blog a Daily Dose of Toni. Today’s topic is some of my favorite websites. I have a lot of websites and apps that I use everyday. Some for work and some for pleasure but all of them make life a little easier. Previous Niko: Let the fun begin! I like “Map My Walk”…forgot about that one. Guess I haven’t been walking much! Love all the Map My products! Paypal… that’s a good one. I didn’t think of that! I use paypal a lot for my business. It works great, especially the iPhone app.